Arrival time after 15.00 (3pm). Departure time is before 10am. Full payment must be received 6 weeks before your holiday commences, if booking under 6 weeks in advance then full payment is required. Any personal belongings left behind will be disposed of unless you contact me within 24 hours. Cancellation policy: If cancelled BEFORE the balance due date (6 weeks before start of holiday) the £50 deposit would be forfeited. If cancelled AFTER balance has been paid, the full amount would be forfeited. Failure to notify renter of a cancellation, will also mean loss of all funds deposited. Duvets and pillows are supplied BUT YOU WILL NEED TO TAKE YOUR OWN BEDDING, TOWELS AND TEA TOWELS. Gas and electricity are supplied free of charge. Please use sensibly as this allows prices to be maintained for future years. Check out availability below in the calendar along with the prices. CERTAIN DATES DISCOUNTS AVAILABLE FOR BOOKINGS OF MORE THAN ONE PERIOD EMAIL ME TO CHECK. CHECK CALENDAR FOR ALL AVAILABLE DATES AND PRICES. 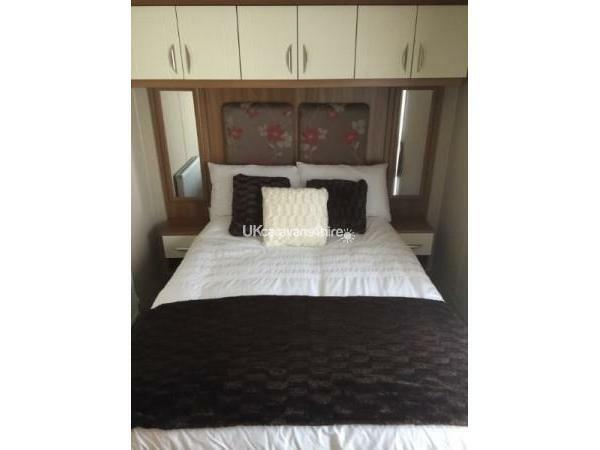 Beautiful 3 bedroom caravan with sea views (sea view plot) finished to a high standard, which has double glazing and central heating, along with an electric fire in the lounge. Beautiful interior, spacious and with home from home comforts it doesn't get any better than this. Perfect all year holiday home. It has a lovely fully equipped kitchen with a fridge/freezer, microwave and full size oven. The shower room has a large shower cubical, sink and heated towel rail. The main double bedroom has ensuite toilet with sink and radiator, two further twin bedrooms along with a pull out sofa bed in the lounge area, sleeps up to 8 in total. All 3 bedrooms have ample storage with the addition of a small wardrobe by the entry door for coats and shoes. This holiday home is fitted with a wrap around contemporary timber veranda along with a beautiful set of Rattan furniture to allow you to enjoy both the days and evening alfresco, plus hi speed Wi-Fi which is included at no extra cost its FREE !! All you need to bring are covers for the quilts and pillows and under sheets for the beds along with any towels you need. The Bunn Leisure site is made up of 3 parks with amazing facilities to keep the whole family entertained. Indoor swimming pools with a lazy river and water slides, gym, funfair, go-karts, crazy golf, indoor arcades and daily/nightly entertainment, there are also several restaurants and bars. Entertainment passes are bought separately direct from the owners reception not through ourselves, which will give you access to all three parks but if you do not want to buy the passes you can still access the restaurants/bars arcades, crazy golf, go karting. Oasis swimming pool, fun fair and beach. The oasis swimming pool boasts a slide, lazy river, children's pool, main 25m pool and steam room. Additional there are beauty treatment and a gym available. West Sands has a great entertainment program for both adults and children, during the day and evening, there aren't many sites with as much to offer as Bunn Leisure do. Holiday Park of the year for 3 years running. Please have a look at there website for full details. Use of facilities at the White Horse site and Green Lawn site, accessible by foot or courtesy bus are also available. Portsmouth, Brighton and The Witherings are only a short drive away. Bognor (top three in the sunshine league and award winning beaches), Arundel (with it's castle, boating lake and wildfowl trust), Littlehampton (with it's beautiful natural harbour and great shops), Wittering (natural and unspoilt sandy beaches offering wonderful views of Chichester harbour and the south downs), Pagham (with it's nature reserve and old railway carriage bungalows), Portsmouth ( with it's new landmark the spinnaker tower and blue reef aquarium) are all only a short car journey away. We had a fantastic week staying at this lovely holiday home, it is everything it states it is so can't ask for anything more than that. The description and pictures give a true account of what you will expect to find on arrival. The booking process again was simple, easy and straightforward, and any queries during the process Jason replied in a timely manner. We chose this mainly for the location looking out over the sea, and again this did not disappoint us. Having the lovely weather we had also meant we could use sitting out on the veranda all week ! But having said that, the weather wouldn't have dampened our spirits as it would have been a lovely spot to do a bit of "stormy sea" watching. The kitchen facilities including the full size fridge/freezer are also an added bonus, it meant that we could stock up on our favourite Ice Cream for the week ! I wouldn't hesitate to recommend this holiday home, and would use again ourselves - a week wasn't long enough ! we have just spent the weekend here and we're really pleased with the standard of facilities of the caravan. It was clean and spacious and had everything we needed for a short break. 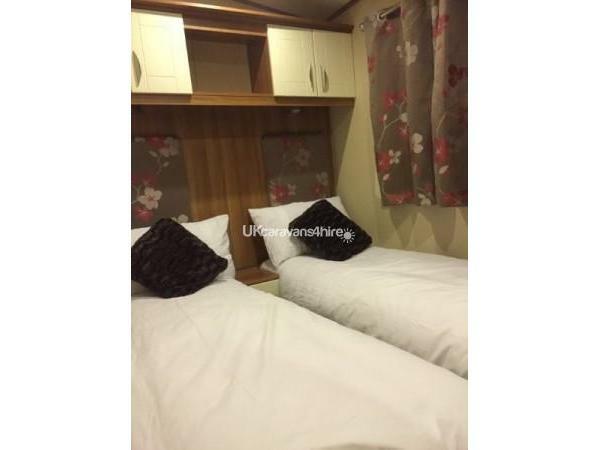 As was previously mentioned in someone else's review I think if your staying in a more premium caravan you expect the beds to be made up on arrival just a minor point but I think it's important when your paying a little bit more for a higher standard. Loved the beach front location and we were lucky to have beautiful weather for October. We will Most certainly use this caravan again and would highly recommend to friend and family in the future. Just returned from a fantastic week, the caravan is in the perfect location and the decking is superb. 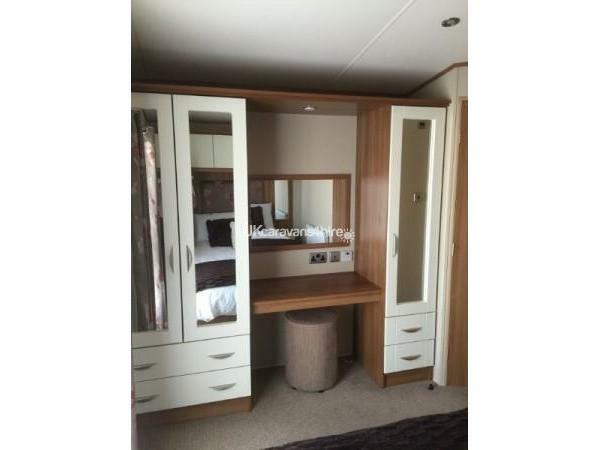 The interior is beautiful with lots of storage could not fault the caravan. The only downside is having to bring your own bedding, I think in an executive caravan you should have bedding provided and beds made up on arrival, maybe this is something to think of for next season. Me and the family have just come home from a week in the above caravan. And we had a fantastic week. That's was largely down to the amazing weather but then to assist was the perfect holiday home in the perfect location. Situated on the sea front this was perfect for us. We were able to be on the beach in seconds and could easily pop back now and again as you need to with little one's. The caravan itself is described perfectly and Jason went above and beyond with every email I sent leading up to the holiday and also while we where there. His help with the little things helped make our family holiday spot on and just what we needed. From the cleanliness of the caravan to the help from Jason this is easily a 10 out of 10 review. We will definitely be looking to visit again. Its great to hear such positive comments from our first review......we will look to build on this to make the future experiences as good or even better ! !